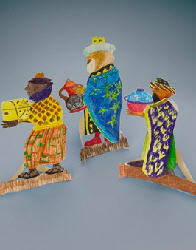 With Día de los Reyes Magos, or Day of the Magi, quickly approaching, here are some great resources for families and schools. • Two of my favorite authors, Alma Flor Ada and F. Isabel Campoy, have a delightful book (aff link) out on this holiday (more books are listed below) and they also have lesson plans available online for K-2nd and 3rd through 6th. You can download their lesson plans in either English or Spanish. • The Tucson Children's Museum has an excellent set of lesson plans that you can download for K- 6th, which includes activities and reading resources. • Amahal y Los Tres Reyes: Amahl and the Three Kings (Troquelados Clasicos Series) (Spanish Edition) from Combel Ediciones Editorial Esin, S.A.
• MommyMaestra has a few freebies for you, such as these Letters to the Magi in English and Spanish and this Reyes Activity Sheet for kids in Pre-K through 1st grade. 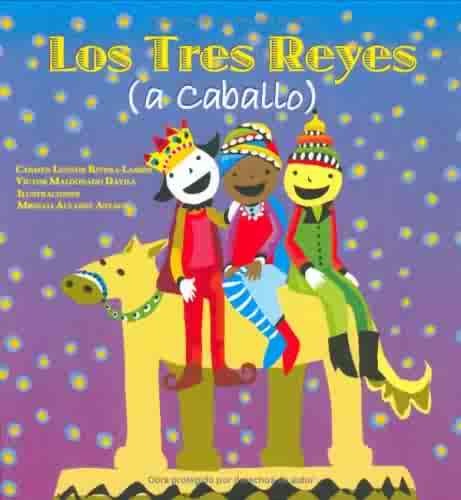 • This Minibook on Día de los Reyes is actually three books (bilingual, English only, and Spanish only) and is perfect for young children. • Older kids may enjoy this Día de los Reyes Reading Passage, which comes with a one-page description of the holiday and an 8-question comprehension quiz. • And finally, my favorite! 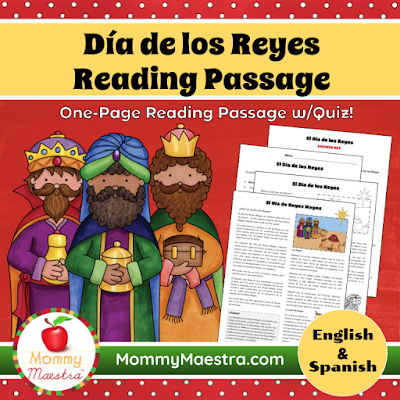 This Día de los Reyes Decoration Packet comes with printable crafts and activities to celebrate the holiday! • DLTK has some okay crafts for the holiday. I thought the wiseman and camel silhouette was actually pretty smart. • Nick Jr. has some cute crafts for Three King's Day including this king's crown, goodie bag tags, party invitations, and this Dora coloring page. • Family Education has a simple crown pattern for your kids to cut out and decorate. But I also really like the ones from First Palette, and their post on creating more durable foam crowns. • Dibujos.org has a banderita template you can print and color. String several together and you have your own Día de los Reyes banner! • Buena Navidad has some adorable patterns you can download, print, cut out, and assemble to create your own Reyes 3-D paper dolls. • Family Fun has a slightly more challenging craft for older kids: Wee Three Kings beanbags! • Jinky's Crafts has the cutest three kings gift boxes! • Las Manualidades also has an easy craft teaching you how to create Reyes from common art supplies. • You can also find patterns for creating your own Reyes out of felt on Como hacerte. • I really like this Paper Three Kings Chain from First Palette. • Activity Village has a really fun Cup and Ball Kings craft that is easy for little hands to make and use. • 2 Pequeños Traviesos also has an easy Reyes craft. • ModernMami has a simple, felt camel craft activity - and it includes easy instructions for making a star of Bethlehem! • Los Reyes Magos App for iPad and iPhone. 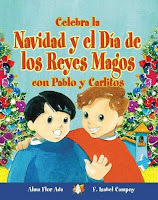 • Dora Celebrates Three Kings Day! on DVD. • Another DVD recently released is this one. However, I have not seen it, so read the reviews and choose for yourself. • Here are three of MommyMaestra's favorite MP3 downloads available for Reyes. • Also, take a look at these beautiful videos. • MisCositas has posted this adorable video of Niko singing "Campana sobre campana"
• El Boricua has a good description of the day and its history in Puerto Rico. • Nibbles & Feasts has this incredible Rosca de Reyes recipe. • I LOVE this post and recipe by From Argentina With Love. • The Muy Bueno Cookbook has shared a list of rosca recipes that they love (and you will, too!). Thanks so much for your kind words about Isabel Campoy and myself and posting one of our books of the series Cuentos para celebrar/ Stories to celebrate. It was a nice birthday gift for me to see this posting this morning. And congratulations on your wonderful site! All best wishes for you and your family on this new year. I love Alma Flor Ada and Isabel Campoy's books and the book about Three Kings Day is one of my favorites. Thank you so much for bringing more attention to this holiday and helping those of us who celebrate with more resources. Gracias! Gracias, Alma Flor. You know I am always happy to share yours and Isabel's wonderful work anytime. Feliz cumpleaños! Laura, you're welcome! Happy to be able to share!